If the thought of quilting straight lines seems daunting, you can try quilting long soft curves. This brings lots of movement to a quilt and they are super easy to do. It looks great as an allover quilt design. A) You can echo your first wave for evenly space the waves. Just like straight lines, this design will bring lots of texture to the quilt. B) Or you can just have fun and make each wave random. This gives you a more organic feel. It also resembles a landscape with hills and valleys. Don’t limit yourself to thinking of this design as water. Do you prefer the echoed waves or the random waves? I never thought of doing waves with my walking foot. I just recently did waves fmq. I practiced drawing them a lot and then tried it. They didn't turn out quite like I wished, so maybe using the walking foot would be a better idea! 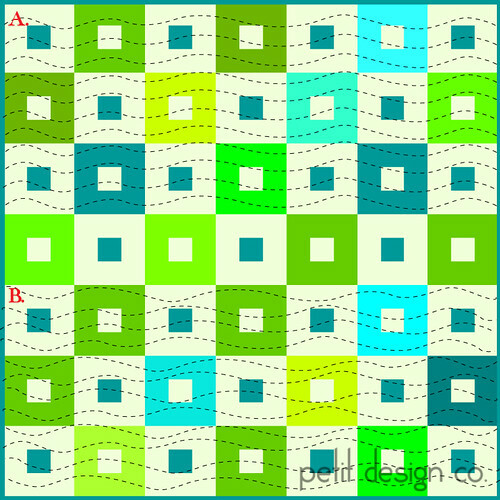 I am taking my first FMQ class on the 22nd but in the meantime I use Waves a LOT. It's so much easier than echoing something (because aren't we hard on ourselves if the line wiggles) and people really notice the waves. I've never thought to use waves, but I like them both! I think random would be great for a wonky quilt. This is such a great series of posts. I can't wait for each new post. Thanks. I like the random. For me I think it would be easier than the echo. Can't wait to see what else you have in store for us!! I have never done echoed waves but I have done some random wave quilts. They were soft and beautiful. Gave the quilt movement. Oh my. How I loved them. So did the people that got the quilts. I used my sewing machine's walking foot. I have a tumbler quilt that is in progress,I think that the random waves would look great on it :) Thank you for all the inspiration and ideas! I have a wonky quilt that I've struggled to find a quilting pattern for. The random waves would work perfectly to soften the angular lines of the piecing. Thank you! I have used my walking foot to quilt wavy lines but used a wavy line stitch to make regular lines. Super easy way to give some dimension to a quilt. Getting ready to try this out, I think I am going with random uneven to give it a little more movement. I've been quilting with a walking foot for a few years, but until I saw your series never even fathomed curviness. Huge thanks! I am wondering, do you go the same direction every time you cross the quilt or do you alternate directions? Does it distort the square quilt to go the same direction? does it cause puckers to alternate? Hi, I've really enjoyed your 31 days of the walking foot. I am self taught and still learning. It would be lovely if somewhere within the 31 days posting, all of us could see the replies from you to all the good questions I've seen on each of the posts. Thank you for sharing your talent with us.